This article, by Ferroclub president Richard Campbell, first appeared in the August-September 2003 issue of 'Todo Trenes'. It followed a separate article on Argentine engineer Livio Dante Porta who had recently passed away on 10 June 2003. Both articles can be found here in their original Castellano. My thanks to Sr. Campbell for allowing this piece to be presented here, and for the photos taken by him to be reproduced. My thanks too, to Sr. Alexis Boichetta, retired General Manager of RFIRT, for alerting me to the article. The combustion of the coal inside the firebox is a complex procedure; the amount of air required and the heat generated depend a great deal on the type of fuel used. It is a two-stage process: first the carbon in the fuel is burnt with oxygen to form carbon monoxide within the fire-bed. This reaction is produced at a temperature of approx. 650ºC, but it is incomplete combustion and only liberates a quarter of the potential energy of the carbon. In order for complete combustion to take place, the carbon monoxide gas must continue to be burnt in more oxygen in order to form carbon dioxide which passes along the tubes and out of the chimney. This second reaction generates a somewhat higher temperature of 1,300ºC, both reactions being self sustainable. Since the burning of carbon monoxide in a normal boiler is produced just above the firebed, oxygen must pass through the coal that is being burnt. If the coal were pure carbon, this second reaction would require the same amount of oxygen as the first reaction. However, the existence of volatile materials in the coal may increase the requirement for secondary air in different proportions. This means that two thirds of the oxygen that passes through the firebars is not necessary at all in the firebed. Since air contains approximately 20% oxygen, the actual volume of air involved increases by a factor of 5. This air is therefore capable of raising the tiny and medium-sized particles of coal and sending them straight out through the chimney, without burning them, with a consequent loss of up to 25% of boiler efficiency when the locomotive is being pushed hard. Another additional problem with conventional boilers is the formation of clinker, which is in other words molten ash solidified. This clinker may form a solid layer over the firebars reducing the air space between them. It used to be common to carry long prickers to break this up, worsening the combustion by disturbing the fire. The temperature at which clinker is produced is normally lower than that of the firebed of a normal locomotive, prejudicing the combustion, since with a lower temperature the passage of air is obstructed even more. Porta sought a way to reduce the formation of clinker as well as the amount of unburnt fuel loss. First he injected steam under the firebed, achieving a mixture of carbon monoxide with hydrogen, a "water-gas" which is burnt above the bed of coal. This vapour reduces the temperature in the firebed, which allows the burning of coals with a high ash content without clinker being formed. Sufficient primary air is admitted to react with the carbon as in a "normal" combustion and produces the necessary heat for the water-gas reaction. Since two types of burning were being produced, Porta preferred to call it "Semi-Gas Combustion System", but over the years, in Spanish, it became known as "the Gasogenous". In order to correct the lack of air above the firebed and for the carbon monoxide and hydrogen to be converted into carbon dioxide, Porta fitted holes in the sides of the firebox just above the firebed, acting as ducts to allow air (oxygen) to enter freely and avoiding the tendency for the unburnt coal particles to be drawn straight up the chimney when the locomotive was being worked hard, since it was no longer necessary for all the air to pass through the firebars. 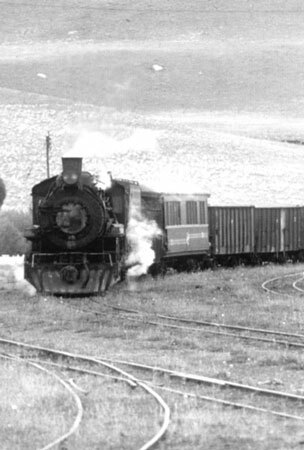 One of his tricks on the Río Turbio line was to also use the fire-door as an air regulator, opening and half-closing it as necessary. A good exhaust ejector completed the system with the aim of improving the draught through the boiler. Perhaps as important as the aforementioned, the more efficient exhaust reduced the back pressure on the cylinders, which thereby achieved a corresponding increase in power output.